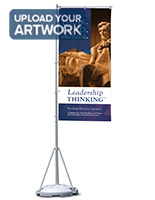 These Flags for Advertising Allow a Business to Develop Comprehensive Outdoor Promotional Displays! Feather Signs are Enhanced when Coupled with Our 17' Flagpoles! 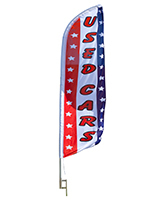 Get the Best Flags for Advertising from the Leading Banner Manufacturer! 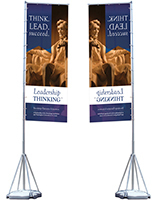 These flags for advertising are printed on a large format digital printer in small batches. The image is printed onto white knitted polyester fabric resulting in a flag that is as resilient as the screen printed versions. All of the edges are hemmed to avert fraying. In addition, white edge reinforcement is applied to one side as well as the top to prevent the grommets from ripping out. The flags for advertising are printed only on one side. Depending on the image printed, the brightness of the back side of the flags for advertising may range from 75-90% of the front image. Dark solid colors provide the best through prints. 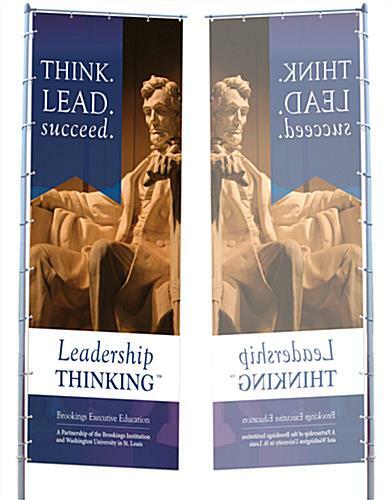 The backside of the flags for advertising has a reverse or mirrored image of the design printed on the front. For this reason text does not read correctly on the back of the flags for advertising. For larger quantities, we recommend silk screened signs or banners for a better through print at a lower cost.